Custom Covers has always considered the continuous improvement of the manufacturing process and a commitment to quality of primary importance. In August 2006 it was awarded the ISO 9001:2000 certification; and in 2018 was upgraded to ISO 9001:2015. Internationally recognised as a sign of commitment to quality, ISO 9001: 2015 is only presented to companies that have been assessed as implementing a quality management system, supported by a dedicated network of staff. Custom Covers' quality management system is based on the requirements of ISO 9001:2015 and approved by Lloyd's Register Quality Assurance (LRQA). The adoption of a quality management system was a strategic decision of the Company. The design and implementation of the management system was influenced by various needs and objectives, the products and services offered, the manufacturing process and the size and structure of Custom Covers. ISO 9001:2015 promotes the adoption of a process approach when developing, implementing and improving the effectiveness of a quality management system, to enhance customer satisfaction by meeting customer requirements. 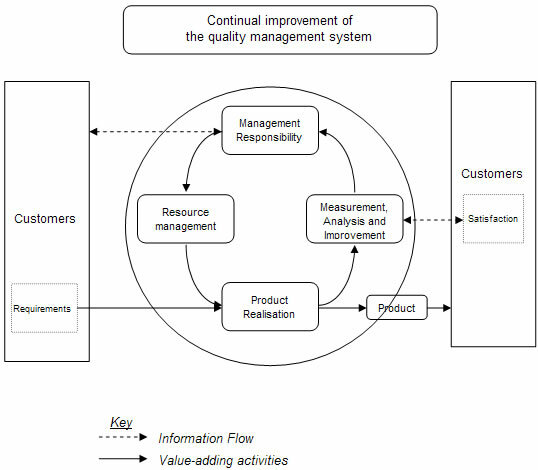 The above illustration shows that customers play a significant role in defining the requirements of the quality management system. The monitoring of customer satisfaction requires the evaluation of information relating to customer perception as to whether the organisation has met the customers' needs and not only provided the product required but also an acceptable level of service and advice. The quality management system is a concept embraced by the whole organisation and is continuously improved by the development of not only the technological side of the business, but also the development of staff through appraisal and provision of training.